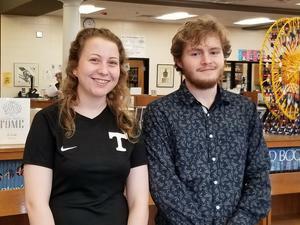 Thomson High School Principal Trevor Roberson announced the Class of 2019 Valedictorian and Salutatorian Thursday. Thomson High School is pleased to announce the Valedictorian and Salutatorian for the Class of 2019. Anna Wallace, daughter of Rhonda and Chris Wallace, was named the Valedictorian Thursday, Feb. 7, by Principal Trevor Roberson. Zeke Brown, son of Amy and Tim Brown, was selected as this year's Salutatorian.